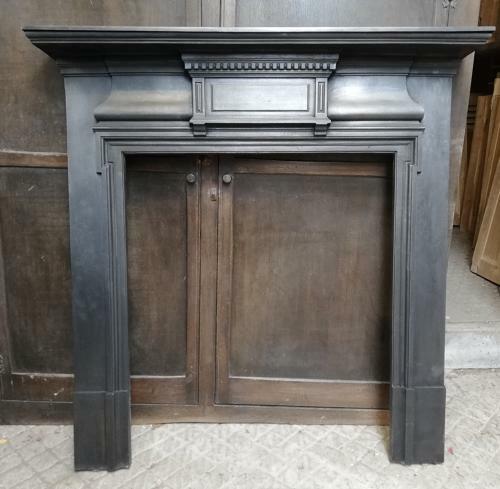 A very attractive and elegant, larger sized, late Victorian cast iron fire surround. The fire has a simple classic style with decorative central design. The mantel has a moulded edge. The iron has been blacked and polished and has a lovely finish. The back of the fire has an RD number, RD 181920, dating the fire to 1891. The surround is of a perfect size for a living or dining room and can be paired with a fire basket or wood burner. The fire is in very good condition but is antique and therefore has some slight signs of use and wear. There are some casting marks to the fire and some slight marks and knocks to the base of the feet. The back has surface rust as expected. A fantastic item that has a fairly plain design suitable for both period and modern properties. A classic item that would be a lovely feature within a home.